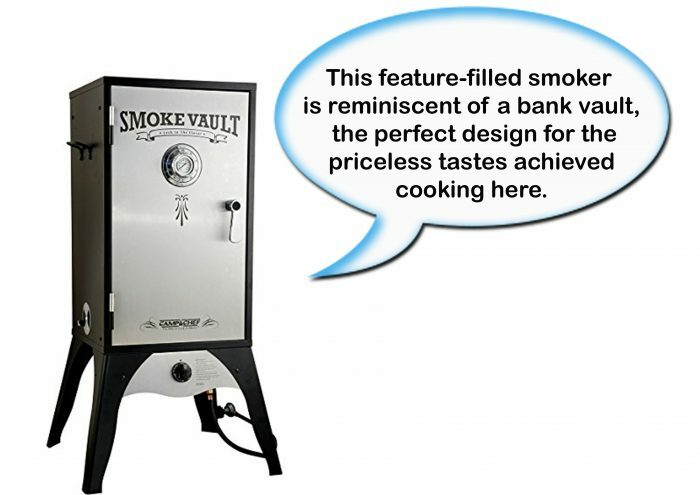 If you are looking to smoke any type of meat with any delicious smoked flavor, right from hickory to mesquite and many others, the Camp Chef Smoke Vault 18″ is a product worth considering. This smoker is one of the most popular ones in the market because of the taste that it can give to various types of meat. As we go ahead and review the Camp Chef 18″ Smoker, we will try to find out if it is all that it claims to be. There’s plenty of room on each of these racks, and since they’re adjustable in height, there’s no limit to the thickness of what you want to smoke. Entire hams, racks of lamb, baby back ribs, and rump roasts can all be accommodated. 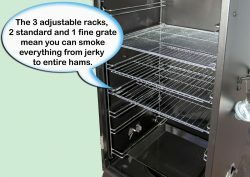 The only limit to the smoking racks is their size, so you also get this fantastic fine-mesh jerky smoking rack. The beauty of this rack is that it is also adjustable, and nothing says it can only hold jerky. What this means is you can try smoking some nice stuffed burgers, your old-fashioned jerky or newer extruded jerky, healthy fish without its skin that still won’t fall through the cracks, and even smoke a meatloaf. Ground meat and flaky skinless fish is no longer off-limits for smoking and that opens up a whole new world of ideas. Smoking meat adds a wonderfully unique and tasty flavor to foods, but the nature of the beast means oftentimes those foods can get dried out in the process. 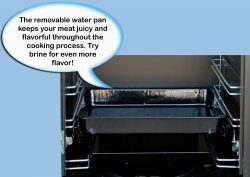 The water pan eliminates that worry as well as allowing for even more possibilities. Steam mikes with your smoke so that both can penetrate your meats adding both flavor and moisture. For variety, try filling the pan with broth, brine, or any other flavorful liquid you think of and add even more depth of flavor. Be careful with alcohols, including beer, due to fire hazards. It can be done, but must be done carefully. With no worrying about holes wearing through or splits from repeated denting that occur in lighter trays, you’re free to experiment with the full range of available smoking media out there. Classic wood chips come in a big variety as well as in chunks and sticks. Other than the longstanding favorite, mesquite, which supplies a rich strong smokey flavor, nearly all smoke wood you will find is made from some sort of fruit or nut tree. Even oak (acorn=nut) is a good option especially if you like the neutral flavor of mesquite but don’t like the heaviness. You can experiment with wood from your backyard as well, but whatever you do don’t use treated wood or any wood full of sap, like pine, fir, or cedar. Maple sounds counter-intuitive due to maple syrup, but it makes a great sweet smokey flavor. Use bigger chunks to minimize the need to tend and for longer smoking, smaller chips if you’re going to be sitting right there while it smokes or for quickie jobs. Experiment with various combinations of wood types and amounts, varying time and temperature, and varying liquids in your water pan to create unique and exciting flavors. Cleaning up after a good smoking session used to be back and knee-breaking work. Grease splatters and drippings especially collect in the bottom of your smoker during the process and must be cleaned to maintain future flavor as well as the longevity of your smoker. Instead of kneeling or bending over to scrub the worst of this residue, you can just pull out the base tray and take it to a more comfortable work surface to clean. You never know when you get started which way the wind is going to turn, or if other factors like wood moisture, bright sun, and ambient temperatures are going to necessitate more or less venting than expected. The ability to open or close to varying degrees these vents, exactly to your needs, can keep your smoking session from turning to an unplanned marathon, or an unsuccessful sprint. Like all smokers’ built-in thermometers, this one can be ten or so degrees off, but it still gives you a convenient ballpark idea of your environment inside the smoker. Ten degrees isn’t a big deal when smoking, but guessing can be. If your goal is 250 degrees but your smoker’s at 400, you’re going to end up with dry overcooked meat long before you expect to need to interact whatsoever. If your plan includes a 375-degree smoke, but you’re only working with 225, you’re going to be waiting a very long time. Securing after-market thermometers can be a royal pain when there’s a perfectly useful one made for it and built in. If you need exact temperatures you could always use your digital meat thermometer for the air inside (I use one with a long wire so that I can shut the probe inside the oven or smoker and keep the display outside) and have it all ready to check the meat before removing. The built-in thermometer has a great wide range from 50 to 550 degrees to encompass even the hottest conditions as well as monitoring the ascent from a cool Fall day to cooking time. No more singed arm hair here. Instead of using a lighter or match to get the flame going in this smoker, all you need is to know how to operate your kitchen stove. That’s right: push and turn just like for the burners in your kitchen. Once you have ignition, adjust to the desired setting and you’re all set to go. This smoker isn’t just for the experienced veteran, it can be a wonderful addition to anyone’s cooking repertoire. To assist in your adventures, Camp Chef has provided recipes and ideas as well as cooking tips to get you off and running. Maybe you’ve never smoked before, or even cooked, but your wife or your buddies have been pushing you to start, or maybe you’ve only worked with a basic grill or the stove, or just watched your Dad and Grandpa smoke when you were a kid. No matter how you got here, you should find some interesting little tidbits, if not a great wealth of information to get you chugging along. 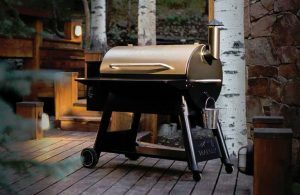 Unlike old-fashioned burners in gas and propane smokers, the burner on Camp Chef Smoke Vault 18″ extends out like a roof over the top of the holes your gas comes out of. This helps prevent dribbles and other residues from clogging the holes or burning in the flames and affecting the flavor. This little “roof” also lowers the frequency of cleaning the burner itself, leaving you more time to enjoy the fruits of your labor. Before every use, clean and then inspect the hose as well as its connection to the LP cylinder. In case of any leaks, it must be replaced before usage. For cleaning the cooking grids and the water tray, use hot and soapy water and then dry it. Coat the cooking grids and water bowl lightly using cooking spray or cooking oil. The burner should be frequently checked for any insects or insect nests, as a clogged tube can lead to a fire. The smoker should not have any foreign particles obstructing the air combustion and ventilation flow. However, if it does, remove using a dry cloth. A good flame should be blue along with a 1” or 2” yellow tip. In case of irregular and excessive yellow flames, there may be deposits of food and oil residues on the burner. Clean the surface as well as the holes to improve them. For cleaning the outside as well as the inside of the smoker, a damp cloth is all that is required. Do not spray-wash with a water hose. Any moisture that is there has to be washed away and should not be allowed to remain on top or inside the smoker. Carefully take out the grease pan, dispose of any grease that may be there and wash it thoroughly. Once it is done, coat the smoker’s interior using cooking spray or cooking oil. In case of any rust deposits on the smoker’s exterior, clean using emery cloth or steel wool. Then apply a heavy-duty and heat-resistant paint. No paint should be applied in the interior. In case of any rust there, clean using the same methods and do not apply any paint. Unlike most residential gas smokers, the Camp Chef Smoker 18″ Smoke Vault is easy to convert to natural gas. 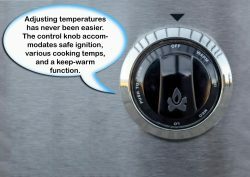 While this may seem like a feature that manufacturers should always provide with their appliances, this is only limited to Camp Chef products for now. Cleaning up this smoker is quite simple and the removable porcelain tray makes it even simpler. Apart from that, you do not need any special cleaning equipment. All that is required is a clean cloth along with some warm soapy water. 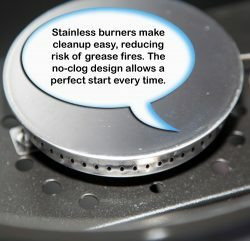 Electric smokers are expensive and prone to failures. However, gas-powered smokers, such as this one, are free from all such issues. It is much more powerful and will give you a quicker response when you adjust the heat, which makes it the perfect smoker and grill to buy for any kind of usage. The Camp Chef Smoker 18″ Smoke Vault has three fully adjustable damper valves, 1 on each side and 1 on the top. This ensures that you can control the heat and smoke as per your preference. This Camp Chef grill and smoker can be used for adding your favorite flavors to anything you want- right from fish, turkeys, ribs to even bread and pies. 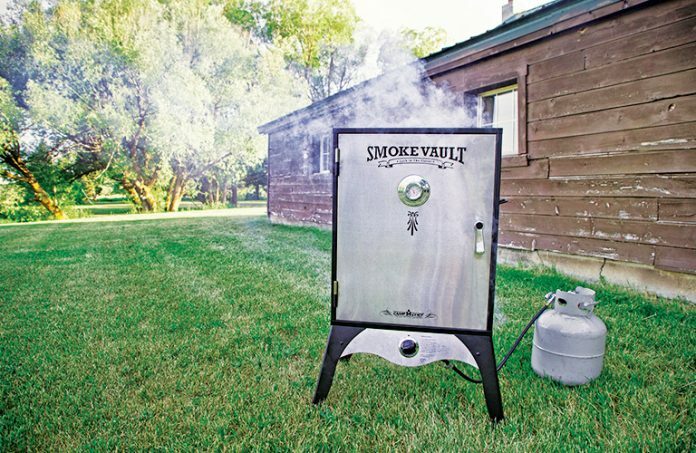 Another distinctive advantage of this smoker is that you can even use it for smoking pizzas, as this is one of those rare products by the vault smoke shop that can be cranked up really high! The Camp Chef Smoker 18″ Smoke Vault is extremely well-built and sturdy. Despite that, it is quite light and made using thin metals. Unlike other cheap and average quality products, this grill is built using quality construction materials and techniques, thus helping it to last longer than any other products in this range. The entire package is not sent in a ready-to-use condition and some assembly will be required prior to usage. Just like other smokers in the market, the thermostat of Camp Chef Smoke Vault 18″ is not quite accurate. On an average, the readings are off by 10 to 20 degrees. This means that you will probably have to invest money in an additional thermostat. For those who have ordered or are planning to order it online, there will be some dents and minor issues with it due to the way the smoker is packed and shipped. As mentioned earlier, the Camp Chef Smoker 18″ Smoke Vault does require some assembly when delivered. However, this is not hard and all instructions are provided with it. So you should have this smoker up and running in just a few hours, similar to other Camp Chef products that have simple assembly process. 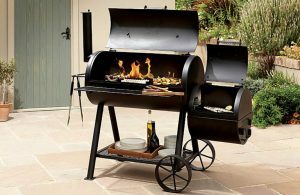 The usage of the smoker grill is quite simple and even beginners can use it with some useful tips for getting the perfect taste in their food at the very first attempt. 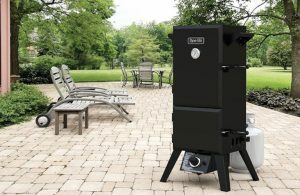 All the components of the smoker are covered by a 1-year warranty, which begins from the day of purchase. This warranty excludes finishing and will be valid in cases of any defects related to the workmanship and material of the components. For the accessories, the same warranty is applicable for a period of 90 days. 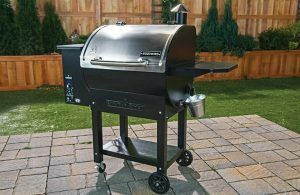 Overall, it is quite safe to conclude from this review that the Camp Chef Smoker 18″ Smoke Vault is a value for money product. Its price may seem a bit more than those offered by most of the other smokers, but it makes up for that in terms of its functionality, performance, and durability. Finding replacement parts of this product is not much hard. Moreover, Camp Chef sells them all on its website. You can get them under the “Replacement Parts” section of their online shop. Any other accessories that can be used with this smoker are also available there. 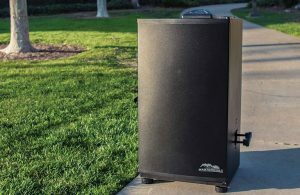 Upon review, it can be said that the Camp Chef Smoker 18″ Smoke Vault is a product that is worth the money paid for it and delivers whatever it promises. This smoker is the right one for anyone looking to get Camp Chef products that are versatile in usage and durable as well. 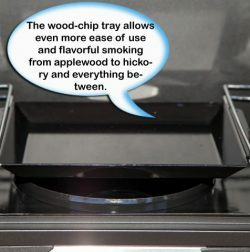 Thus, by now, you must have learned enough from this Camp Chef Smoker 18″ Smoke Vault review to make an informed choice. Like other top-class Camp Chef grilling units, this one is definitely a durable and functional smoker. If it fits your budget and requirements then it is the best one you will ever get. Question: How much assembly is required to make this product ready? Ans: All that the user has to do is assemble a few bolt-on parts and the legs. Question: Is maintaining the temperature easy in this smoker? 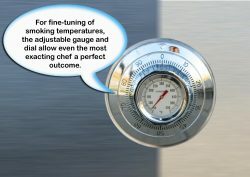 Ans: It may take a couple of uses to break it in, but the temperature management of this smoker is quite better. It offers precise temperature control if that is the kind of cooking you are looking to do. Question: Which one is a better choice, chips or chunks? Ans: Chips are better suited if you are trying to do some quick smoking, with one full load of the chip tray lasting for 2 hours. However, chunks are generally a better choice overall. Question: If the provided thermostat is not accurate then what are the alternatives? Ans: Apart from the one it provides, you can also get a digital thermometer and keep it an inch away from the rack. That initshg’s perfect for what I need. Thanks! I simply needed to appreciate you once more. I’m not certain the things that I would’ve used in the absence of those secrets revealed by you on such a problem. It was before a troublesome concern in my circumstances, however , being able to see your well-written way you managed it forced me to leap for gladness. Extremely happy for this work and in addition have high hopes you comprehend what an amazing job you happen to be doing teaching the mediocre ones by way of a blog. Most likely you have never met any of us. Thanks for believing in us! You are the ones that really make us proud with such praising notes. Lovely to have you as a part of our family! Youre so cool! I dont suppose Ive read anything like this before. So good to seek out any person with some authentic thoughts on this subject. realy thanks for starting this up. this web site is one thing that’s needed on the internet, somebody with slightly originality. helpful job for bringing one thing new to the web! You are cool too dude. Hope to here more from you! Bookmark and browse it as your daily meal 😀 and let us know how it tastes.